Vladimir Mikhailovich Petlyakov (Russian: Влади́мир Миха́йлович Петляко́в) (15 June 1891 - 12 January 1942) was a Soviet aircraft designer. 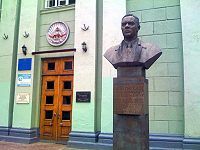 Petlyakov was born in Sambek (Don Voisko Oblast, Russian Empire) in 1891 and studied in Taganrog's technical college (today "Taganrog Petlyakov Aviation College", ru:Таганрогский авиационный колледж им. В. М. Петлякова) from 1900-1910. In 1917-1918, Petlyakov worked as a technician in the aerodynamics laboratory at Moscow State Technical University under the guidance of Nikolai Zhukovsky. In 1922, he graduated from the same university. In 1921-1936, Petlyakov worked at the Central Aerohydrodynamic Institute under the guidance of Andrei Tupolev. In 1936, he became a chief aircraft designer at an aviation plant. Petlyakov was directly involved in organization and development of Soviet metal aircraft construction. In particular, Petlyakov (together with an engineer Nikolai Belyaev) elaborated methods of calculating durability of materials and theory on designing metal wings with multiple spars. Petlyakov was in charge of designing the first heavy bombers TB-1, TB-3 (1930-1935), long-range high-altitude four-engine bomber Pe-8 (1935-1937), dive bomber Pe-2 (1939-1940) and introducing them into serial production. He died in an air crash on the way to Moscow, near Arzamas in January 1942. Vladimir Petlyakov received the State Award of the USSR (1941) and was awarded two Orders of Lenin and an Order of the Red Star. Vladimir Petlyakov Pictures and Vladimir Petlyakov for Sale.